On Sunday, June 15, the conference bus departure from the city center to the hotel BOSS is foreseen. Participants who would like to use this transport are kindly requested to come to the meeting place in the main hall of Warszawa Centralna station, just near to Rossmann Drugstore entrance ((X) in Fig. 1) by 15:45. Dr. Dorota Klinger will wait there for participants (phone: +48515259521) and will guide you to the bus parked some 200 m. from the station (B). The ISSRNS 2014 venue is Hotel BOSS in the south-east of Warsaw, about 20 kilometers from its center. You can reach it from the town center by by a Fast City Rail (SKM) line no. S1 (preferred) , bus 521, or by taxi. In the very center of Warsaw is situated the Palace of Culture & Science – the characteristic huge stone building with a spire on top. The SKM line S1 in the direction of Otwock – you can catch at Station Warszawa Śródmieście (2) (departing every 30 minutes from 4am to 11.20pm). Once on the train, do not forget to validate your ticket. After a 30-minute ride get off in Miedzeszyn (10th stop). Take the route shown on the map in Fig. 2 and some 10 minutes later (c.a. 500 m distance) you will be in Hotel BOSS, the ISSRNS 2014 venue. The S1 you can catch also at station Warszawa Wschodnia (Warsaw East, on the on the other side of Vistula river, not shown on the map) serving both international connections and domestic traffic, including SKM. The 521 bus in the direction of Falenica – The 521 bus stop (A) is located near the Warszawa Centralna station (1) on the opposite side of the Al. Jerozolimskie street. After a 30-minute ride get off in Miedzeszyn. The distance from this stop to the BOSS hotel is about 600 m.
The TAXI - You can get to the ISSRNS 2014 venue BOSS hotel with a taxi. Licensed taxi companies offering their services at Warsaw Chopin Airport, are Ele Taxi, Sawa Taxi and Super Taxi. Journey to the city center from Chopin airport should cost around 50 PLN and to the BOSS hotel around 80-100 PLN. If you arrive at Warszawa Centralna railway station, look for MPT Taxi, Sawa Taxi and Ele Taxi. Remember that taxi tariffs should be clearly displayed in the car window. Avoid any people who will offer their taxi services in the arrivals hall. Their fees are several times higher than those of licensed corporate taxis. 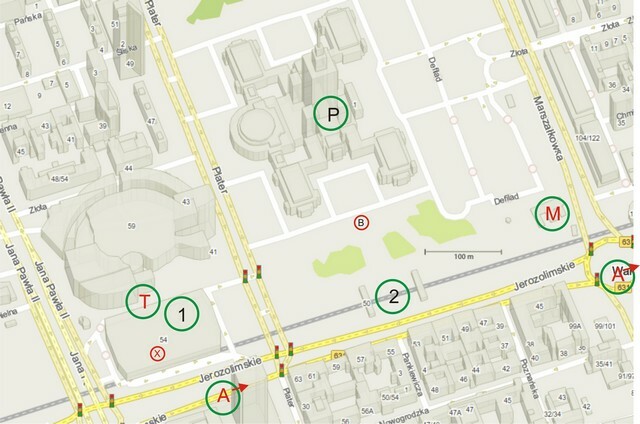 You can find useful information about taxis in Warsaw here:http://www.warsawtour.pl/en/warsaw-essentials/getting-around/taxis-1728.html. The Ele Taxi company has an agreement with the BOSS hotel, and their prices to the hotel can be slightly lower for the ISSRNS 2014 attendees. The city is served by two international airports: Warsaw Chopin Airport, located just 10 km of Warsaw, but still within the city limits, and Warsaw-Modlin Airport, located 35 kilometers to the North. You can take the S2 Fast City Rail (SKM), which leaves every 30 minutes from 6am to 10.30pm. Once on the train, do not forget to validate your ticket. After approximately 30 minutes you will leave at 7th stop at the Warszawa Śródmieście station (2). The other SKM line S3 from Chopin Airport ends at Warszawa Centralna (1). 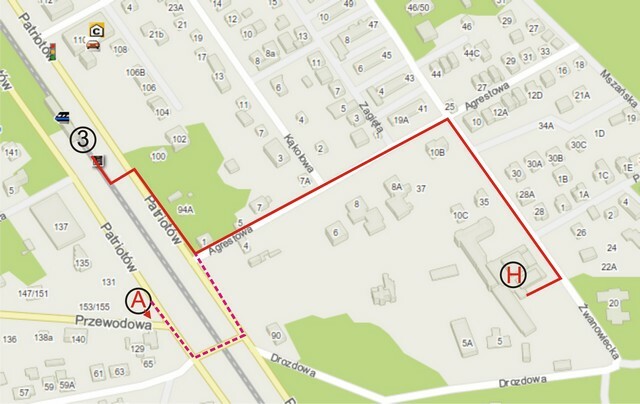 Alternatively, you can catch a city bus 175 and get out at the bus stop opposite to Warszawa Centralna (A). Tickets can be purchased on board of the bus, at the airport, or online. The latter way is recommended because it guarantees you will not miss a bus for lack of free seats. Alternatively, you can buy tickets on site with cash (including foreign currency) or card. Take a ride to Warszawa Centrum. It will take from 45 to 60 minutes, depending on the traffic conditions. You will arrive in the very center of Warsaw, right in front of the Palace of Culture & Science (P). Just keep it on your right and after a five-minute walk through parking lots and walkways you will reach the Warszawa Śródmieście station (2). Usually, the railway station that best suits ISSRNS 2014 attendees' purposes is Warszawa Wschodnia (Warsaw East), serving both international connections and domestic traffic, including Fast City Rail (SKM). However, due to a reconstruction of an important part of the railway network in Warsaw, there are many changes in serving train connections, including the end stations for extraurban (both domestic and international) and city connections. The end of this reconstruction is anticipated to be on June, 15 (a day, when our conference starts), but it may be a bit earlier or later. Therefore, when travelling by train, we strongly recommend you to check the current endstation in frequently updated timetables available online and/or ask the train conductor. If your train arrives at Warszawa Wschodnia, to get to the BOSS hotel you can catch from the same station the S1 Fast City Rail (SKM) in the direction of Otwock. If your train arrives at Warszawa Gdańska, please take the metro to the Centrum station (M), and from there follow one of the above described routesd to the BOSS hotel. A common ticket system is shared by all the means of public transportation in Warsaw: trams, buses, and railways of all types. Ticket machines can be found at and around the railway stations (principal are: Warszawa Centralna, Warszawa Wschodnia and Warszawa Gdańska) and the airports, as well as at many (though not all) bus- and tram stops elsewhere and on board of some buses. They accept credit cards and of course Polish currency. The cheapest option is a Single Fare Transfer Ticket for 4.40 zł (around 1 EUR), which allows you to ride for 75 minutes while freely transferring between lines. This is enough time to reach the ISSRNS 2014 venue from the Warszawa Wschodnia, Warszawa Śródmieście and Warszawa Centralna stations. If your journey starts at the Chopin Airport, it may be safer to buy a 90-minute ticket for 7.00 zł. A reliable point-and-click trip planner for Warsaw can be found here. Just select your start and destination points on the map and press "Search". Alternatively, street addresses and names of objects of interest (hotels, museums, railway stations, airport etc.) can be typed in the text fields marked A and B in the top-left portion of the screen. Most of the proper names are only accepted in Polish but the search is greatly facilitated by a list of hints.